1305503090 -This best-selling comprehensive book conveys the relevance of sociology by presenting a timely collection of theories, research, and examples — including its signature first-person accounts that open many chapters. These “lived experiences” are relevant to students and introduce themes that provide a framework for learning the chapter material. Kendall’s vivid and inviting writing style, emphasis on applications, and eye for compelling current examples further highlight sociology’s relevance to all students. 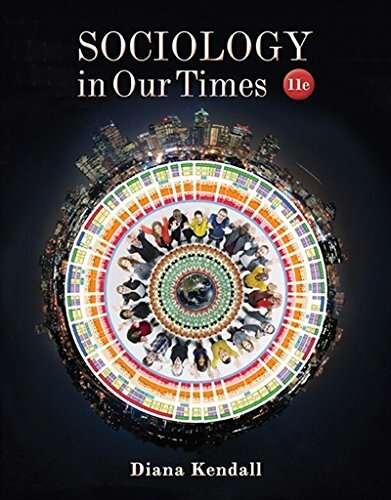 Now in its eleventh edition, SOCIOLOGY IN OUR TIMES is acclaimed for being the first textbook to integrate race, class, and gender issues, and for its thorough presentation of sociological theory, including contemporary perspectives such as feminism and postmodernism. This edition focuses more on social/global change and on the contemporary world, presenting such current debates as bullying and social media abuse, digital-age methods to increase school attendance, food trucks and the spread of culture, modern slavery, and weight bias.